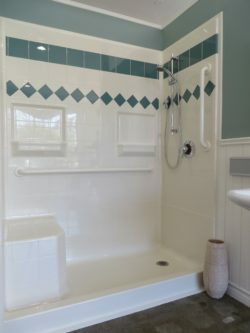 Installing a walk-in bath may be a necessity for many people, but new features and design improvements in accessible bathing means you can have an indulgent, luxurious soak as well. In addition to the safety benefits of not having to clamber awkwardly in and out of a standard bath, many walk-in baths are now constructed from a single piece of seamless fibreglass with a totally smooth surface. ORCA HealthCare has also released The Liberty Walk-in tub, which has a brand new, patent pending, movable hinged seat; creating a comfortable alcove that is easy to hop in and out of. In the past, you may have been cold and uncomfortable while waiting for your walk-in bath to fill up; but newer models come equipped with a heated panel in the back of the seat, allowing you to get cozy right from the start. Light some candles and turn on the therapeutic air and water jets and you’ve got a truly five-star experience. You could even relax to your favorite music without interruption, taking advantage of the quiet whirlpool pumps that have now been developed. 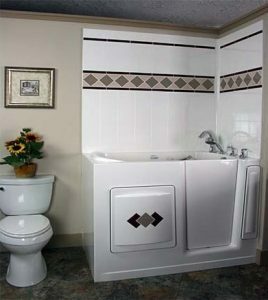 With all these improvements in the accessible bath industry, you can have the safe, stress-free and relaxing bath that you deserve. Click on this link to see the complete range of walk-in baths available from ORCA HealthCare. 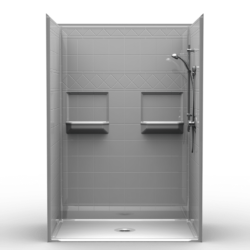 Next Next post: Accessible Showers: We Hate Wet Bathroom Floors!